The Department of Psychology fully embraces the flipped classroom approach to education, which we use to demonstrate psychological phenomena, as well as experimental and data-analytic techniques. Students will be regularly designing and conducting their own experiments and projects. Furthermore, students will be encouraged to develop their skills by actively contributing to faculty research projects: we firmly believe that psychological science is best learned from active psychological scientists, and interested students will be able to work alongside us as voluntary assistants, in our new dedicated research facilities. 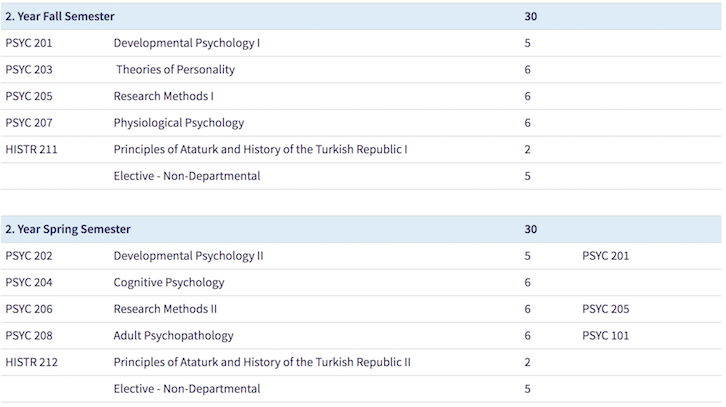 The Department of Psychology teaches entirely in English. Our faculty, as well as our department, includes native English speakers. Moreover, our faculty is in collaboration with academics from top universities around the world who are experts in their area. Students are recommended to give priority to courses in their registered semester. If there are any non-taken or withdrawal courses from previous semesters, students should complete those courses firstly. After completing these courses, students can also take courses from upper semesters with the approval of their advisors. Students can take more than 36 ECTS (up to 42 ECTS) with obtaining the signature from their advisors. Relevant document can be requested from Registrar's Office. The document should be signed by their advisors. 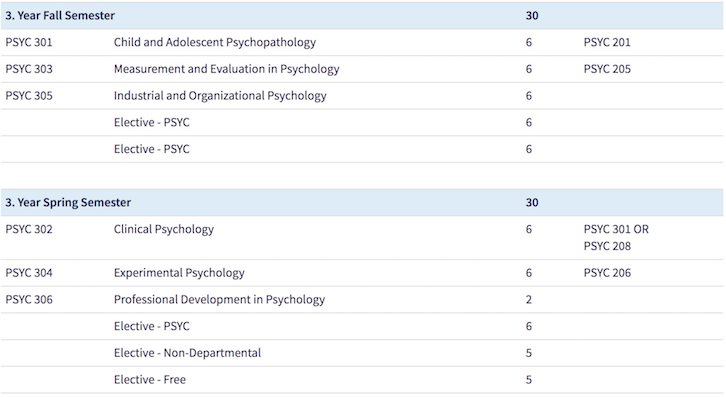 Elective courses in the Psychology Department are categorized into three subgroups: departmental elective, non-departmental elective and free elective. 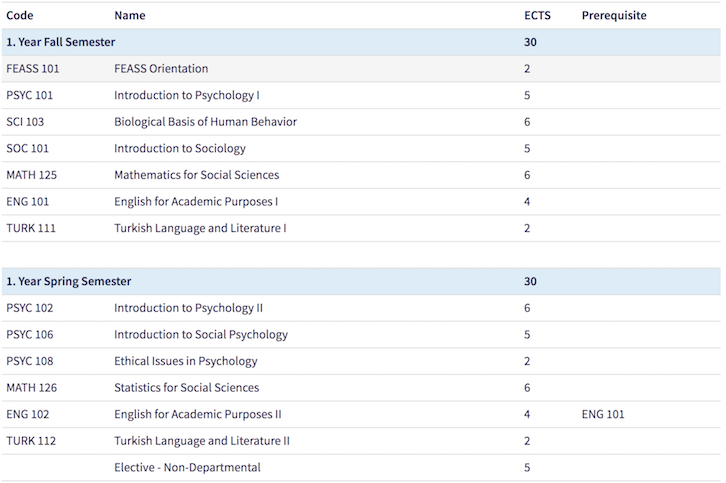 Departmental elective courses include PSYC code courses offered by our department. Non-departmental courses are offered by other departments (no PSYC code courses). Free elective courses include both departmental and non-departmental courses a student can take. Students can take 20 ECTS non-departmental, 18 ECTS departmental and 25 ECTS free elective courses. There is no compulsory internship in our department. However, students are encouraged to do an internship and lead to institutions in our department. You can have further information at the in internship link page on our website. Training in psychology provides a broad range of skills, easily applicable in many industries. Psychologists work in clinics, therapy and rehabilitation centers and hospitals, in schools and education, in human resources and personnel selection, in marketing and market research, in research companies, and in advertising agencies. The major objective of the psychology department is to have graduates, who are equipped with the basic skills of critical and scientific thinking, research in addition to the fundamental ethical principles. Psychology department undergraduate program is designed to provide students with theoretical knowledge and applied skills in basic fields of psychology. By including detailed training of both theoretical and applied aspects of psychology, the undergraduate program aims students’ evaluation of the field from a different perspective. For that aim, learning different research methods, scientific critical thinking, and applied educational skills are highly valued in the program. The MEF University's Psychology program provides students with a thorough grounding in the scientific study of mind and behavior, preparing them fully for graduate study in the specialism of their choice. In the first year, students familiarise themselves with the basic divisions and concepts of psychology, while developing firm foundations in essential related disciplines including biology and statistics. In the second year, students conduct a deeper study of the key theoretical areas of psychology, including cognitive, developmental, and physiological psychology, and receive thorough training in scientific method, research methodology and data analysis. This training continues in the third year, when students also apply their theoretical knowledge to the study and treatment of psychopathology, and to understanding workplace behavior. Finally, in their fourth year, students conduct four distinct original group research projects, alongside advanced study in the faculty's own research areas. Although the Department of Psychology does not require an internship, it is highly recommended that students challenge themselves by seeking various internship opportunities at hospitals, firms or schools. The Department provides guidance as to reliable sources of internships students can take. Prospective students may apply with an acceptable high school diploma (those in the last year of high school, with their transcript), international diploma (such as IB, Abitur etc), national high school exit/university entrance examination score, or with an international university entrance examination score (such as SAT, GCE, ACT). The full list of acceptable diplomas/examination and their minimum scores are available on the university’s website. Applicants, who do not have acceptable proof of English proficiency at the time of application or university enrollment, sit the MEF University English Language Placement and Proficiency Examination. Students who do not pass the Proficiency Examination will need to study in the MEF University English Language Preparatory Program until they meet the required level. The acceptance decisions are given to the applicants meeting the application criteria based on the relative merit of applications. Applicants are informed about their acceptance decision and a scholarship offer and asked to confirm their intention to enroll with a payment of a deposit of USD 250 on the university’s bank account. The deposit is counted towards the first semester’s tuition fee but is non-refundable in case of non-enrolment. After payment of the deposit, an official letter of acceptance is issued. Accepted students are solely responsible for their student visa applications.